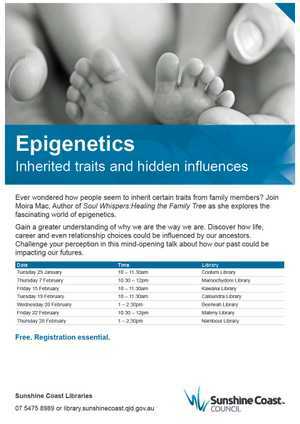 Ever wondered how people seem to inherit certain traits from family members? Join Moira Mac, Author of Soul Whispers:Healing the Family Tree as she explores the fascinating world of epigenetics. Gain a greater understanding of why we are the way we are. Discover how life, career and even relationship choices could be influenced by our ancestors. Challenge your perception in this mind-opening talk about how our past could be impacting our futures.